This is FRESH AIR. I'm Terry Gross. Our guest, Dr. Homer Venters, spent nine years as head of New York City's Correctional Health Services, where he oversaw the care of thousands of inmates in the jails on Rikers Island. He writes that most of the inmates there are in housing areas so decrepit that weapons are easily fashioned from parts of the wall, plumbing and light fixtures. So everyone there is usually around inmates who are armed, he writes, and there's almost nothing to be done about it. That's far from the most troubling observation about Rikers Island in Venters' new book. He details horrific cases of inmate deaths from beatings and neglect and describes some hard-won institutional changes that improved things some after sensational press accounts and a U.S. Justice Department investigation of conditions there. Homer Venters left Rikers Island in 2017. He's now a senior health and justice fellow at Community Oriented Correctional Health Services and an associate professor at New York University's College of Global Public Health. He spoke with FRESH AIR's Dave Davies about his book "Life And Death In Rikers Island." DAVE DAVIES, BYLINE: Homer Venters, welcome to FRESH AIR. I wonder if you could begin by just describing Rikers Island. Do you remember the first time you went there, what it was like? HOMER VENTERS: I do. I happened to go there for the first time on a day where there was a very strong snowstorm. And as someone was showing me around some of the facilities, the snow was coming down so quickly, it really did seem like a scene from a sci-fi movie. I couldn't believe that the structures looming up, one after the other, were real. The yelling coming out - the two biggest and most well-constructed facilities at the time on the island were these big buildings that looked like hotels, but they were built for solitary confinement. So people screaming and yelling out of those big structures through this, like, very thick snowfalls left an indelible impression on me. DAVIES: And what was it like getting inside one of the buildings? VENTERS: I think that going into each of those facilities was, you know, a shock of - to the senses in terms of what you smell, what you see, what you hear. Often because you're going from one housing area to another, you're focused on moving through a series of barriers, things like sally ports, which are these big spots where you have multiple gates to go through. But as you're moving through, you are always hearing what's happening in the place you just left. And you're often hearing what's awaiting you around the corner in the next place. So it's a very chaotic setting. DAVIES: Early in the book, you described the case of an inmate named Carlos Mercado, guy who was arrested and taken to Rikers. He was a diabetic with a pretty straightforward medical need. What happened to him? VENTERS: Well, this is a case that was reported on by multiple sources and really, even though it was a patient that our health service was caring for, taught me about some of the real shortcomings in access to care in our jail system. The patient - this patient came in, was declaring to multiple people along the way during the intake process that he was a diabetic and needed insulin. It's important to know that, in many jails, the intake process involves being shuttered (ph) from one set of pens to another. And by pen, I mean a big open structure that could hold 30 or 50 adults standing up, laying down - really just standing there as they're being identified for a security process. Then they move from one pen to another to another. That whole process could take, you know, 12 hours, 24 hours. And then, ultimately, they should be presented for a medical intake. And so during that long process in a loud, chaotic intake corridor, Mr. Mercado was reporting to multiple people that he was an insulin-dependent diabetic. And the response he was receiving was that the security officers didn't believe him. They thought that he was actually withdrawing from opiates, which is a very common cause of nausea and vomiting. But he was telling them what his health problems were. He ultimately then made it across to the medical unit and even there did not receive prompt enough attention but along the way, nausea, vomiting - given a garbage bag to vomit in as he got sicker and sicker - and died from diabetic ketoacidosis, a completely preventable death. DAVIES: Right. And at one point, he was actually in a cell still asking for insulin. Right? VENTERS: Yes. And this is - this type of death really shows, in a very stark way, how jails confer health risks to people that aren't just about suicide and homicide. Certainly, people are killed in jail through physical beatings, and they take their own lives through ignoring their mental health problems. But for a person to know that they are a insulin-dependent diabetic, to report that and then for any state institution to fail to act on that, really puts the onus and responsibility for this man's death directly on the jail system. It's just a horrible, horrible outcome. DAVIES: Now, there's another guy - another inmate named Angel Ramirez, who had another medical condition not uncommon to people just coming into Rikers Island. He was going through alcohol withdrawal. Tell us what symptoms he experienced and what it led to. VENTERS: This is, again, a tragic, tragic case. And I will say that one of the things these two poor gentlemen share is that much of the worst treatment that they received happened in this intake corridor of a single jail where there are many, many preventable deaths associated with what was happening in these pens. But in this case, Mr. Ramirez was identified as somebody who was withdrawing from alcohol. And so as physicians - health care providers, actually at all levels, we know that alcohol withdrawal can be fatal. It's something that we have a very protocolized system to identify and treat. We even, in this jail, for this patient had a special housing area to take him to so that he could get the medications and monitoring he needed. But when he started to exhibit what are the predictable signs - some of the most serious cases of alcohol withdrawal can involve what's called delirium tremens, which - if you've ever heard somebody say they see pink elephants - very wild hallucinations, wild behavior - that's exactly what he exhibited. There was a brief scuffle in that housing area. And then at that point, what should have happened is he should have been brought back to the medical unit where he could receive higher level of care, either in the medical unit or transferred to the hospital most likely. Instead, he was taken to that intake area - and this is information we didn't know in the health service but came out through later reporting - was taken to that same intake area, put into one of those intake pens and beaten savagely until his spleen was lacerated. He was then dumped in the medical clinic after being put into a clean jumpsuit without any information about what had just happened to him. And then medical staff started to intervene. They transferred him to the hospital, but he ultimately died of internal bleeding from blunt force trauma. DAVIES: And this was a case that did become public. There was an investigation. Were the officers who administered the beating disciplined or charged? VENTERS: I am not aware of the disciplinary outcomes. But I am not aware of criminal prosecution in this case. And that is really important because in a lot - many of the cases that I mentioned in the book, there were either local or actually, more recently, federal prosecutions for civil rights violations. But in this case, we were stunned to find out these incredibly important facts about the case a year or two later, after the incident. And then I haven't been aware of any criminal prosecutions in this case. DAVIES: The story of Carlos Mercado is a horror story. The story of Mr. Ramirez is a horror story. There are many horror stories in this book. And in some cases, individuals are found to have broken the rules and may be identified and disciplined or charged. But I think the message of your book is that there are systemic problems at Rikers and in many jails that almost ensure these things are going to happen from time to time. So let's look at this. I mean, why didn't a guy who needed insulin and asked for it get it when it was steps away? VENTERS: Well, I think that there are individual answers. So we could look at whether or not individual officers had been trained adequately on identification of, you know, patients who are in distress. That's something that correctional officers generally do receive training on - how to spot and then report to medical when a detainee or a patient, in our terms, is in distress. I think, though, that what's important to consider about jail settings is that they are incredibly dehumanizing. And they dehumanize the individuals who pass through them - the detainees, the inmates, the patient, however you happen to - whatever label you use - so that it is actually quite an inexorable slide for security staff and, to some cases, health staff, to stop considering the people in front of them as people. They look at them as problems. They look of them as liars, as malingerers. In this jail, one of the things that was quite common was people coming in in opiate withdrawal. And so there are lots of people that were having nausea and vomiting. And so officers would get into, I would suppose, the habit of presuming that people were having opiate withdrawal when they could have been having, you know, a fatal complication from a medical problem, as was the case with Mr. Mercado. DAVIES: Homer Venters spent nine years as head of New York City's Correctional Health Services. His new book is "Life And Death In Rikers Island." We'll talk more after a short break. This is FRESH AIR. DAVIES: This is FRESH AIR, and we're speaking with Dr. Homer Venters. He spent nine years as head of the Correctional Health Services in New York City. His book about the experience is "Life And Death In Rikers Island." One of the remarkable things that you describe in the book is how this antiquated paper system of keeping track of everyone is so chaotic that your staff would actually spend large amounts of time wandering all over these jails trying to find people. You want to just describe this? VENTERS: There are many parts of working in the jails - really, everyday there are things you encounter where you wouldn't believe before that day that this was a problem. But in this instance, patients would be moved from one housing area to another. And sometimes their move would be updated a couple of days later in the - somebody would have to type it into a computer system. But it would mostly be updated on a paper-based log. And since I left, they've started implementing some wristbands that could be scanned. But it's the same problem. It's that an officer has to do something. You have to affirmatively track it. And so for us with a big health service, you know, thousands of patients on medications every single day, we had pharmacy technicians, psychologists, nurses who were working hard just to find the patients who had missed medicines who could be facing a life-threatening event if they missed that medicine because it was so routine that we couldn't find our patients that - there was no thought that we could find everybody who didn't get their medicine today. But we would make short lists of the people who missed medicines that were, you know, what we would call life-sustaining medicines or, you know, who could face a very dire health outcome. And that expenditure of energy for that purpose would become revealed when patients had very bad outcomes. And a horrible example is the case of Bradley Ballard, you know, a schizophrenic gentleman who had been bounced from housing area to housing area. And it's not clear to me - even when health staff went into a housing area and had the responsibility to check on him and everybody else - if they would have known, who are the people in this housing area? And so we would expect that they would ask the officer, who are all the people in here? But if the officer's list is not the same as the health person's list, this creates an opportunity for patients to fall through the cracks. And when the patients are having, you know, active psychosis, then we probably find them. But if they're deteriorating in quiet, then we miss them. DAVIES: You say that transparency is a key to changing things. And there's a lot of stories in here about information that wasn't shared or ever collected. Do you want to give us an example or two of that and why it matters? VENTERS: Yes. I think that the - my first project or my first area of real focus around collecting data and trying to figure out how to get it publicly reported involves injuries. And so I started in the New York City jail system shortly after a young man had been deliberately killed. Christopher Robinson was an 18-year-old, I believe, at the time he was killed in an adolescent jail, RNDC. And his death prompted, as I was coming in then as the deputy medical director, prompted my supervisors to ask me about the occurrence of injuries in that jail. And I started to look into it with my staff and other stakeholders, and we found a high level of - high incidence of hand fractures and jaw fractures among the kids in this adolescent jail. And it prompted us to really dig into - track much more aggressively what types of injuries were happening but, more importantly, start getting new data about intentionality, about who was doing the injuring and about whether or not somebody was handcuffed when they were injured, whether or not they were hit in the head when they were injured - really important data that could help us understand whether or not injuries were reflective of abuse or neglect. And so this digging into injuries in the wake of Christopher Robinson's death led us to make major modifications to our electronic medical record, to produce reports that we could push out not just to our colleagues in the Department of Correction but to other city agencies, the oversight agencies, and ultimately to the Department of Justice. DAVIES: Right. It's one thing to say you want more information about these incidents; it's another to get it. A lot of that means relying upon prison staff who may or may not be cooperative. What was your experience? VENTERS: That was my experience. I believe that these systems are - you know, they're paramilitary, and so they're designed to keep information from outside, prying eyes. And that is often because people fear litigation. But it is also because there is not, really, a true respect for the rights of the detained. And health staff, more often than not, end up under the thumb of a security agency or a security authority when they're considering what kind of data to report or to share out. And so for us, it was important to build in our electronic medical record a new injury surveillance system that would allow data to be automatically gathered from every single injury encounter and then create reports that would go to stakeholders outside of our service and even outside of the Department of Correction because I've been in that moment where you're with a patient and there's a correctional officer or multiple officers or even a senior officer - right? - a captain or higher. And there is a lot of pressure in that moment. And sometimes that pressure actually could be too much for a doctor or a nurse to push back on a demand or a request. Or it's very - it creates - those dual-loyalty pressures that are very, very acute. And so our solution to that, aside from training people about dual loyalty, was to build this electronic medical record so that that could be our human rights tool, our surveillance system, to get the data out, outside of the heat of the moment. DAVIES: You eventually got this electronic record system up and running, and the result was some real data about injuries and an internal report on the use of force within the prisons. What became of that? What did it lead to? VENTERS: Well, the data that came out of the electronic medical record was crucial for several big steps. But I would say that that data, as with the book, really is important when it's matched with some of the really horrible personal stories that were also happening at the same time. But for instance, when it comes to the use of force, much of the data that we were able to report out of our electronic medical record and through our work was important for the U.S. Department of Justice when they were deciding to and then actually coming into conduct what - a civil rights investigation of the New York City correctional system. And so when they were coming in with their team of experts to assess - was brutality a widespread and systematic problem in the city jails for adolescents and how the correctional staff treated them? - we were able to push them many, many important data sets. You know, one data point that's really incredible to consider is that there was a time when, if an adolescent was in a violent conflict with someone in Rikers Island - if the conflict was with a correctional officer - they were more likely to sustain a blow to the head than if the conflict was with another inmate. And it's stunning because obviously correctional officers have enormous amounts of training about avoiding blows to the head, you know, just incredible investment of time. And also, you would think that most inmate fights start with a shot to the head. But that data point alone was really - you know, we could only do it because we had developed this injury surveillance system. But it was one of many that we pushed to the DOJ. The other big data set that we found very, very helpful is we did a large-scale analysis - I think the first-ever large-scale analysis of exposure to solitary confinement where we looked at 225,000 jail admissions. And we found that the people ever exposed to solitary confinement had a - about seven times higher risk of being in a self-harm cohort, that is to say to physically harm themselves. And that data set, along with, you know, a very bad case of Jason Echevarria, helped us really push the Department of Corrections to move from wanting more solitary confinement for mentally ill people to actually eliminate the practice of solitary confinement for persons with serious mental illness. GROSS: We're listening to the interview FRESH AIR's Dave Davies recorded with Dr. Homer Venters, author of the new book "Life And Death In Rikers Island." After a break, we'll hear more about his nine years overseeing health care in the jails on Rikers Island. And Lloyd Schwartz will review an album that includes two popular concert works performed in an unusual way. I'm Terry Gross, and this is FRESH AIR. GROSS: This is FRESH AIR. I'm Terry Gross. Let's get back to the interview FRESH AIR's Dave Davies recorded with Dr. Homer Venters, who spent nine years as head of New York City's correctional health services. He oversaw the care of thousands of inmates in the jails on Rikers Island. His new book is titled "Life And Death In Rikers Island." DAVIES: When you were there, solitary confinement was used quite a bit - for what purpose? VENTERS: Well, the stated purpose was to promote the safety of the institution and to punish people for violating the rules of the jail system. But as it became very quickly apparent, it was used for lots and lots of reasons, often to retaliate against individuals who had annoyed or offended individual officers. And as we ultimately found out, once our analysis became more sophisticated, it was used with great disparity against people of color. DAVIES: Tell us about the story of Jason Echevarria. VENTERS: It is a harrowing story among some, you know, very difficult stories in the book. But he's a young man who had long been identified as having a cascade of mental health and behavioral issues in the jail system. So he was in solitary confinement. And he was in a unit that is hard to believe that it existed in the United States. But this was a solitary confinement unit for persons with mental illness. So he was in a unit where people with serious mental illness, all sorts of mental illness were held in - supposedly to punish them for their breaking of jail rules. He then, in a gambit to get out of solitary confinement, presumably ingested more than one toxic soap balls. These are very concentrated, toxic, industrial-type cleaning soap balls that go into, like, a 5 gallon mop bucket. The reason he had access to them - being in solitary - was because people so routinely clogged their own toilets in solitary that the housing areas of solitary were often overrunning with sewage. And so in this evening, the correctional officers went down the tier throwing some of these soap balls into the cells, telling people to slop out their own cells of sewage. And when this happened, he swallowed - I don't know - a number of them. He quickly told security staff and health staff what had happened. Health staff made it clear to the security staff that what he had just done could potentially fatal. He needed to be brought out immediately. And instead, what happened was he was kept in that cell overnight. As you will also hear in many of the worst jail stories - not just at Rikers, but elsewhere - at some point, the video and lights went out on the unit - because there was some video coverage of just the central part of the tier. But by all accounts, he was screaming in agony as his esophagus was burned by this soap, screaming for help for hours, being taunted by the correctional staff - a really harrowing death that was witnessed by everybody on the tier. And when the lights went back on and the video started back up, he was found dead in his cell. DAVIES: So what was it like on a unit of solitary confinement cells when there's raw sewage covering the floor of the cells, and I assume, the corridors too? What was that like for everybody? VENTERS: It is horrific but also dehumanizing. And it really reflects, quite well, the end result of the practice of solitary confinement. That is to say, you have officers trying to act as if they are conducting normal business. You have patients who are decompensating for mental health problems or simply doing extreme things to try and get out of there. You have health staff coming on and off those units as quickly as they can, because while they want to protect their patients, they also are seeing this day after day after day. And some patients, you know, don't take a very quick action. They may do things over time in these solitary cells as they really decompensate. And so I've been inside these cells to talk to patients multiple times when they've smeared feces all over the inside of the cell, or they're working to light a fire inside their cell - just very, very extreme behaviors. And all - any one of these observations should be enough to reaffirm that this is a horrible practice, that we should've never built this unit and we need to back away from its use everywhere. But certainly, this idea that we had a unit like this, full of people with mental health issues, that we then thought would lead us to some other outcome, is just full of folly. DAVIES: It would seem obvious that someone with serious mental health problems would find them exacerbated by being in solitary - confined 23 hours a day. 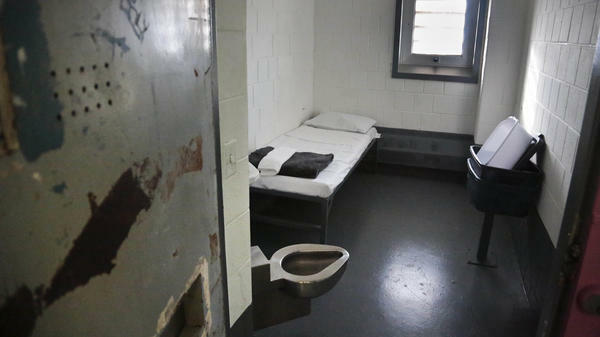 So the rule now is - no more solitary for people with mental illness in the jail. VENTERS: For people with serious mental illness, for adolescents. I think that - one of the concerns I have is that, you know, as the pendulum swings - not just in the city jail system but all over the country, I see this. There are, you know, this tendency to punish people when what they need is either just human engagement or treatment for a behavioral health problem. That tendency to punish really is very persistent, and it pops up in lots of ways. And so it takes - it's one of the reasons that independent - not just having an independent health service is important, but having an independent oversight body over every jail in prison is critical. Because I see this punishment construct pop up everywhere I look, even when you make some gains in eliminating one policy that you know is harmful. DAVIES: You know, you note in the book that, over time, investigations by - the Justice Department, by others, the press coverage of them and lawsuits - had an effect, both in curtailing solitary confinement - due to your own efforts - and also to - in curbing the culture of violence that was there, to a degree. And you've written about the resistance that you got from correctional officers and the correctional officers union. And, you know, it's interesting to consider their perspective. I mean, you certainly talked to a lot of these folks. And it sounded as if those changes left them feeling abandoned and unsafe - unprotected from abuse and violence that they suffer all the time. I mean, these are not people who came in to these jobs as - right - sadists and monsters. Right? I'm wondering how you view their plight and their perspective. VENTERS: Well, I think that I would make two points. The first is - I believe that the correctional officers, and particularly the health of correctional officers, is, to a large extent, ignored around the country. We have half a million correctional officers. Even with successful decarceration - let's say we go from 3,000 jails down to, you know, 1,000 jails - we'll still have - probably - jails, and we'll still have correctional officers. And they need to be healthy. And they need to have jobs where they're safe. And that - there's big parts of what we're talking about that's actually been ignored for the correctional officers. But one of the things that I learned, often the hard way, is that just documenting the harms to our patients - let's say of solitary confinement or of our patients being beaten - was not enough to stop the practice. Because we needed to work with correctional staff to develop an alternative, you know, from the - in the mindset of the officer who was, really, rewarded and supported in taking a heavy hand, if you will, with inmates over the years. What we need to do is come with another tool. And often, that tool involves references. We talk - I talked a little bit in the book about the crisis intervention team training, about some of these alternate units that we built - the clinical alternatives to punitive segregation. Coming up with units where, not just the patients are safer, but the officers are safer, and there really is a true team-based approach between the health staff and the correctional staff. Those - having a better alternative is crucial because that is the first thing the officer wants to know is - what is going to happen when you say I can't do X or I can't do Y? And it's a very practical question that often - because reform in jails is often driven by litigation, often what happens is correctional officers are told stop doing this without a clear sense of what they're supposed to start doing. And that can promote violence, in lots of terrible ways, that may not be from them, but it may be just their inability to secure the control of the jails. DAVIES: I mean, you mentioned crisis interventions teams. This was - involved circumstances where there was an escalating conflict between, you know, an inmate and some correctional officers. And rather than use force, they're - you bring in people who are specialists in de-escalating conflict. It works? VENTERS: It does. And it's been, you know, well-proven in the community with the police for, you know, decades. I think that one of the things that's difficult about CIT training is that the value of the training, actually, is not - it's a 32-hour training, usually. And it's not 32 hours of classroom. It's that - for most of that time, you have a security staff with health staff together. And then they're working with what we call model patients or standardized patients who are people who are decompensating in front of them in the room. And they have to physically figure out how they're going to handle this. And they're supported by an instructor and by the other trainees. And going through 32 hours of this training together, where they're handling - physically handling - these scenarios is what gets them ready to do this out in the jails. And it's - you know, there's nothing more striking than to see a CIT team going down the hallway - the long hallway of a jail - to respond to an incident instead of one of these probe teams or CERT teams full of, you know, 10 people in riot gear. DAVIES: We're speaking with Homer Venters. He spent nine years as head of New York City's Correctional Health Services. His new book is "Life And Death In Rikers Island." We'll talk more in just a moment. This is FRESH AIR. DAVIES: This is FRESH AIR. And we're speaking with Dr. Homer Venters. He spent nine years as head of the Correctional Health Services in New York City. His new book is "Life And Death In Rikers Island." How much sexual assault was there at Rikers? What did you learn about it? VENTERS: What I learned in my time in the city jail system is that sexual assault is hidden. Many of the systems that we believe exist to provide a safe avenue for reporting are not viewed as safe or reliable or even ethical by the people we hope will use them. And so we worked hard in the Correctional Health Service to build up a much more robust reporting mechanism. But, you know, up until when I left, I continued to hear from people who were in the jail system who said they don't feel safe reporting. They don't feel like the response from the security service and often from the health service was going to be one that helped them. And so it remains an area of great, great failure in our correctional settings. DAVIES: There's a woman named Maria whose case you describe. You want to just briefly tell what - tell us what happened to her? VENTERS: This is a patient who reported being targeted inside the jail system by a correctional officer, a male correctional officer, being very quickly identified as vulnerable, first approached with kind of a compliment or two, then almost immediately separated from the rest of the people in the housing area and then subject to repeated sexual abuse that was often violent that also involved contact in and intimidation of her family on the outside and repeated abuses over multiple incarcerations in the women's jail. DAVIES: And there were cases - I forget whether it was this or others where the correctional officers who did this with regularity said, you're going to have to continue to service me after you're out and would get information about their families to have leverage. VENTERS: Yeah. I think that one of the areas of control that is really underappreciated - when we think about abuse inside correctional settings we think about, what physically happened to the person who is there. But the use of family members as targets has really profoundly - profoundly devastating. First of all, it will lead someone to acquiesce to almost any kind of abuse to try and protect their family members. But also, it obviously is devastating for the individual once they go home. I've had both men and women patients report to me that they were concerned about their family members after interactions with correctional staff, and the family members' names or identities had been invoked. And then add to that the fact that Rikers actually has an already humiliating and degrading visitation system. DAVIES: You made some progress while you were there, I think. Should Rikers close? VENTERS: Absolutely, you know, for a lot of the reasons we've talked about and many other reasons. But the closing of Rikers is absolutely necessary. It's not sufficient to transforming the criminal justice system in the - in New York City to become more humane. But it's necessary. The jails that are in operation are crumbling. If you're a correctional officer, almost anywhere you work, any housing area, any hallway, any intake pen is so dilapidated and falling apart that inmates easily can arm themselves - and do for their own protection - with bits of hardened material that are broken off from walls, from pipes, from ceilings. I think the other important element to this is that we have much more work to do to lower the jail population. We've made great strides in New York City, more than most big cities have. There were probably 22,000, 23,000 people in the jails when Giuliani was mayor. It's now under 8,000. So really incredible progress, but there is much more work that can be done to create alternatives that involve treatment for people with serious mental illness and also to really develop supportive housing, which is an important element to why people cycle in and out of jail - is the lack of stable housing. They can also involve treatment for addiction and for mental health problems. DAVIES: You know, jails and prisons are, you know, intense, often dehumanizing environments that - you know, inmates say that it changes them, correctional officers probably, too. Do you feel that it changed you in some way, your experience there? VENTERS: I think that it has given me great confidence and hope in the power of applying a human rights framework to these inhumane settings. It's also given me great confidence in the ability of health staff to act as identifiers and reporters and preventers of human rights violations. I do think that the problems of Rikers are, in many cases, the problems of jails and prisons everywhere in the United States. So I'm sure it has changed me. It certainly has left me with a zeal to continue this work all over the country. DAVIES: Well, Homer Venters, thanks so much for speaking with us. VENTERS: Thank you so much, I appreciate it. GROSS: Dr. Homer Venters' new book is called "Life And Death In Rikers Island." He spoke with FRESH AIR's Dave Davies, who is also WHYY's senior reporter. After a break, Lloyd Schwartz will review an album that includes two popular concertos performed in an unusual but illuminating way. This is FRESH AIR. (SOUNDBITE OF GEORGE FENTON'S "IMPROMPTU NO. 3 IN G-FLAT MAJOR, OP. 90, D 899") Transcript provided by NPR, Copyright NPR.